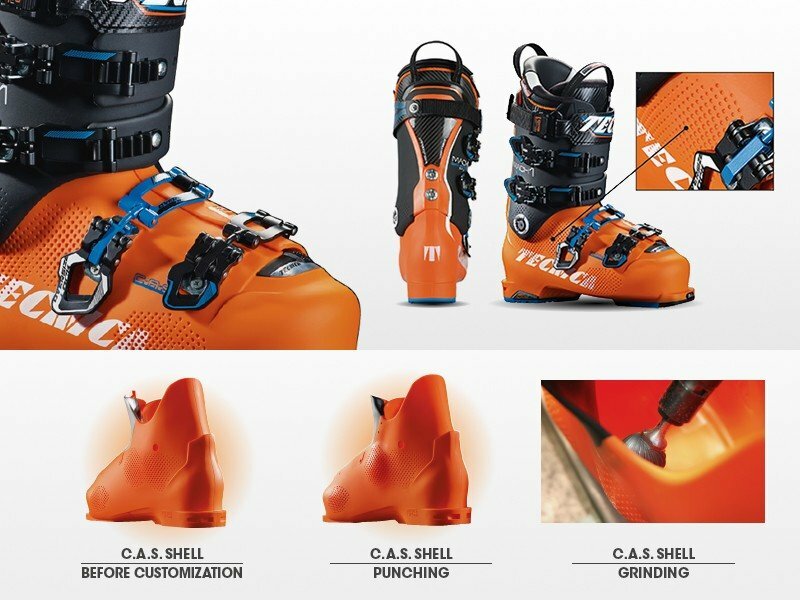 Compared to the Pro version, the Tecnica Zero G Guide Ski Boots add a few more grams and have a different liner, coming in at a stated 110 flex (though testers have found it very similar to the "130 flex" Guide Pro). 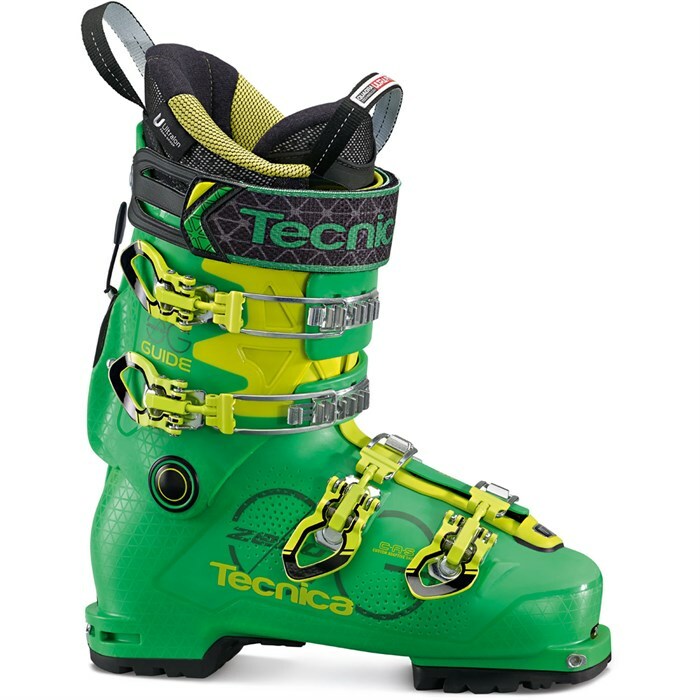 Supremely versatile, with the potential to be a one-boot quiver for skiers who split their ski time between lifts and touring, the Tecnica Zero G Guide Ski Boots proved a winner in their inaugural season and deserve consideration. C.A.S. Shell  Custom Adaptive Shape shells are anatomically formed around the heel and problem areas at the factory. Common punch zones are plainly marked with a dot grid pattern on the shell, and the new polyether and Triax 3.0 shell materials offer improved stability when heated. 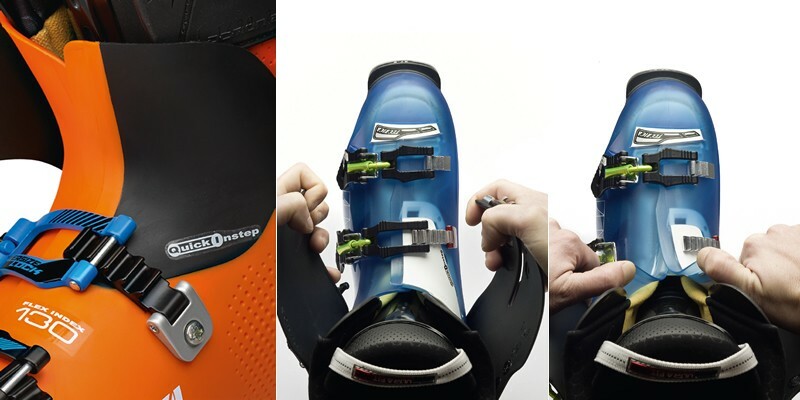 Quick Instep  A shaped plastic component at the instep that is softer than the rest of the shell helps you to step into and out of the ski boot. C.A.S. Grindable Boot Board  The removable C.A.S. boot board offers plenty of thickness for grinding and a grid pattern for reference. Bootfitter's Notes  The Zero G shells use the same last as the new Cochise line, with a 99 mm forefoot and narrower midfoot than previous Tecnica "average" lasts. Volume around the ankle is much reduced, though the instep height remains fairly relaxed as is typical for Tecnica. The new Triax 3.0 plastic punches well and holds its shape without turning tacky, but care should be taken when attempting aggressive punches at the bi-injection seam line. Flex: 110  A stiff flex that's still forgiving enough for narrow chutes, trees and mellow pow days. Ultrafit Ultralon Liner  Heat moldable liner with Ultralon foam. Power Light Design  Bi-injected triax 3.0 frame that is 30% thinner and 2.5 times stiffer than conventional boot material. 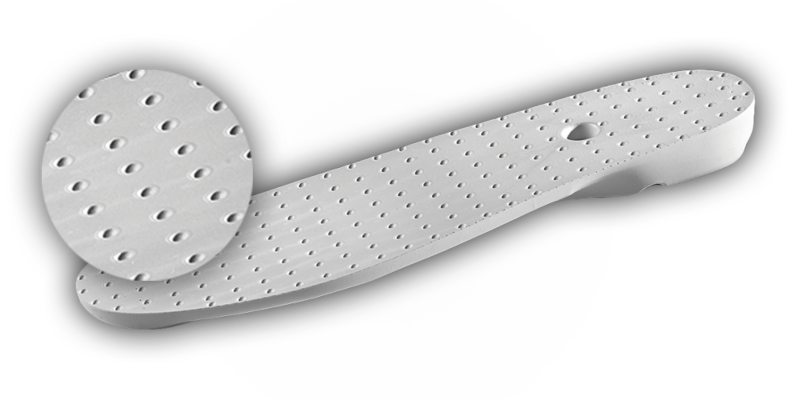 Results in an 18% weight savings without a loss in performance. Mobility Cuff Walk/Ski Mode  Tecnica's redesigned walk mode features a 44˚ range of leg movement, a super smooth pivot action, and metal-to-metal contact in the locking mechanism. The new S.A.S (Self-Adjusting System) tightens the locking action as the metal wears to eliminate play. Zero G Buckles  Extra light full aluminum buckles with innovative Lift Lock mechanism and extended cuff hook. Lift Lock  A simple mechanism holds the buckle above the shell to keep it free from entanglement while putting the boot on. Aqua Stop Water Protection  Bi-material water protection system with double ridge structure.